Guy Fieri is headed back to the ranch. Food Network just announced Guy’s Ranch Kitchen will return for a second season in November. Season two of Guy’s Ranch Kitchen premieres on Food Network on November 17th at 12:30 p.m. ET/PT. 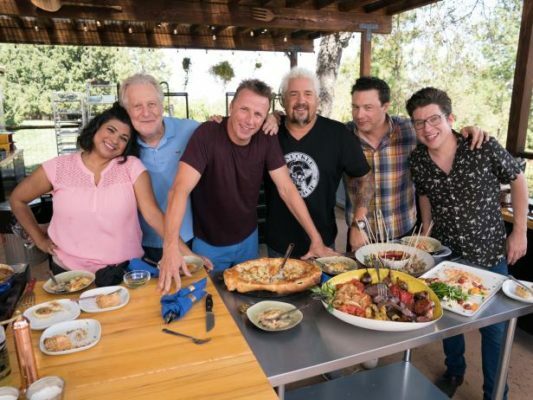 NEW YORK – October 12, 2018 – There can never be too many cooks in Guy’s Ranch Kitchen, as Guy Fieri and some of his celebrity chef friends cook up spectacular spreads on the new season, beginning on Saturday, November 17th at 12:30pm ET/PT. Throughout the fourteen half-hour episodes, Guy and some of his pals, including: Rocco DiSpirito, Duff Goldman, Eric Greenspan, Alex Guarnaschelli, Antonia Lofaso, Aaron May, Michael Mina, Marc Murphy, Damaris Phillips, Carl Ruiz, Aarti Sequeira, Michael Voltaggio, Justin Warner, and Jonathan Waxman, come together for a mouthwatering meal. As some of the most talented chefs in the country, they try to outdo each other by serving up the most delicious dish. Whether it’s Mediterranean mashups, southern spreads, brunch bites, or holiday feasts, these bigtime chefs bring the bigtime flavors on Guy’s Ranch Kitchen. On the premiere episode, Guy is expecting over a hundred guests for a multicourse Thanksgiving feast at the ranch and has decided to do a trial run with a few of his best friends. He puts each one in charge of preparing a dish for the festive meal. Alex Guarnaschelli adds an Italian spin on Thanksgiving with a lasagna appetizer and roast turkey with mozzarella and pepperoni stuffing. Marc Murphy reinvents the traditional holiday meat with his savory turkey shepherd’s pie and a classic side of Brussels Sprouts and bacon. Jonathan Waxman prepares Capoducken, a capon stuffed with a duck stuffed with a guinea fowl with chorizo and oyster stuffing. It’s not a celebration without libations and dessert, so Alex pours festive and classy cranberry Aperol spritzers to go with Marc’s red wine-cooked apples with pecan crumble. Over the course of the season, Guy and his friends serve up memorable meals including beef short rib stroganoff, grilled escarole Caesar salad, whole roasted branzino with salsa verde, Asian duck confit with hoisin mole and more. With so many skilled chefs in the kitchen, the competition is fierce and the dishes are superb, and the friendships are the icing on the cake. What do you think? Have you seen Guy’s Ranch Kitchen? Will you watch season two? More about: Food Network TV shows: canceled or renewed?, Guy's Ranch Kitchen, Guy's Ranch Kitchen: canceled or renewed? It was quite boring in Season 1, see no need for a second season.